As cars rush by at the end of a busy workday, curious pedestrians stop to look at a mangled, bright blue Audi in the KTOO parking lot. 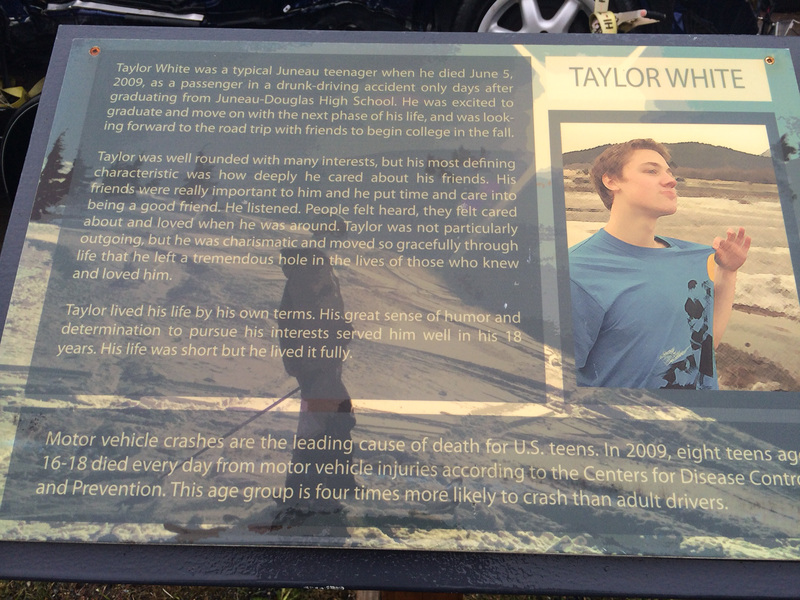 The car is part of a display from the Taylor White Foundation for Advancing our Community, Inc., started by Taylor White’s parents, after the 18-year-old Juneau-Douglas High School graduate was killed in a drunk driving accident in 2009. Four signs explaining the incident were created by students in the Thunder Mountain High School Digital Art Class. According to Carol White, Taylor White’s mother and co-founder of the foundation, it was important to get Juneau’s youth involved. “It needs to be messages that kids are giving other kids rather than adult generated messages,” says White. The Juneau Police kept the vehicle in the impound lot for a year as possible evidence. The driver, 18-year-old Tyler Emerson, pleaded guilty to criminally negligent homicide in August 2010. He was sentenced to six years in prison with five years suspended. He went back to jail for nine months in 2012 after violating his probation. The Whites got permission from Emerson and his family to show the car and “to be sure everybody was feeling like it was gonna be worth the pain,” White says. The car has been displayed 15 times in the past four years. The narrative is deeply personal, describing Taylor White as a good friend, though not particularly outgoing. Other signs recount the accident in great detail and include facts about drunk driving that put the tragedy into perspective. For example, car crashes are the leading cause of death for U.S teens. The crushed Audi sparks different reactions from different people. “Seeing the car kinda made me melt inside,” says Honour Miller-Austin, a student at Thunder Mountain, adding that it reminds her of a friend that had recently passed away. 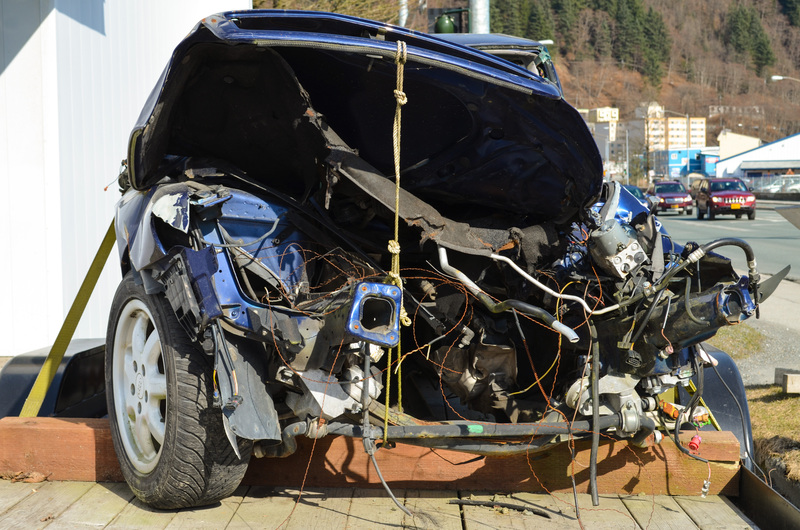 They agree that five years after the accident, drunk driving is still a major problem in Juneau. “I think it’s exactly something that could happen to friends. My brother lost his best friend in a drunk driving accident,” says Chris O’Brien, also a student at Thunder Mountain. The display, though aimed at teenagers, also makes adults stop and think. “I often wonder what it would be like if they made Juneau a dry town. Things like this wouldn’t happen,” says Wayne Smallwood, an MMA fighter and Native carver. Jessica Louise Billy, an 18-year-old Juneau-Douglas senior, died in a car crash last month. According to Alaska Department of Transportation & Public Facilities, six teenagers died in car crashes in Alaska in 2013. The car in the KTOO parking lot is part of a safe driving initiative spearheaded by KXLL, KTOO’s sister station, and includes student-voiced public service announcements and a high school dance which raised $400 for the Taylor White Foundation.